Love the ability to move through tide progression. Unique and helpful. Would like to be able to have tide stations in favorites if possible. Best weather app out there! I have now logged more than 66000M on my 7m40 long boat covering the British Iles, Ireland and The Netherlands round past Spain and on to Italy. Passage making or going up river till the boat grounds (at 1m) I know what I want from tide information. A weeks coefficients and H and L heights and times for the expected area are copied out on a formica board and kept at the chart table for reference at all times even when the boat is ashore for maintenance. All the times should be dated unambiguously (d/m or m/d).Try a line for date as punctuation between the data blocks. Even the British Admiralty now use metres for depth. Remove the ft. It is just clutter and as such can only be a source of error or confusion. Remove the reference to the previous or next tide which is just more clutter ( and wrong see 6)). The time NOW appears at the top of the screen on my iPad. I can do the rest. Cut the clutter of words. HW and LW are well understood and not even needed if the data is decluttered. Add Tidal Coefficients. The British shun them because they are foreign but they are one of the most usefull tools available when working depths and calculating tidal stream rates. In the data box under Type: add the data source. On the UK E Coast be ready a comfortable half hour before any time and watch. Rubish in a tidal stream can reverse direction without loosing speed at tide turn. Heights depend heavily on North Sea conditions and sometimes match the tabulated values sometimes. Just listen to the Thames Navigation radio for the river pilots. Keep it simple.Just provide the numbers with their source and leave the skipper to do what skippers do. Good advice Mate ! Most are for Windy but some are only for skippers. OK to remove the ft, but may be this unit is used in USA? HW and LW is fine. Strange to me that you like tidal coefficients. Are they available in UK? I’ve never see them used in this country. At # 6, I don’t understand the examples you give, is it just to show that everyone does not display tides in the same way? Love having tides included on windy well done. But the format is a little clunky. I'd stick to m and ditch the feet. Also the date format used is confusing with potential depth. A standard date format would be great, so that it's not confused with other data. Well done though. Windy is amazing and so useful for my sailing and skiing ! 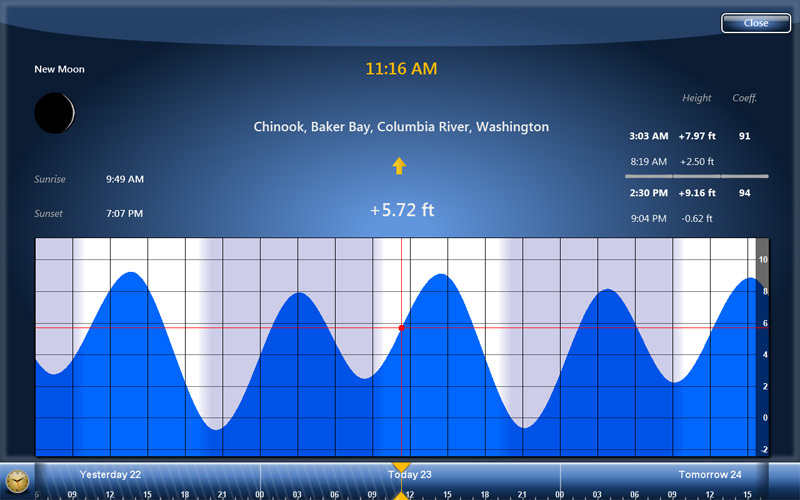 Please look at the forecast for the Columbia River near Vancouver, WA. There are two tide "forecast" stations near each other wild wildly different data. One is noted as "dubious accuracy". If someone would not notice that "dubious accuracy" note in the title, this could get them in trouble. Was directed here from another post. I am trying to find a quicker way to get my local/closest tide data without having to zoom way in on my android device. There are a lot of tide stations near me and I have pinch zoom a bunch just to get to the correct data. I feel like I'm doing something wrong. I wish there was a button somewhere when you have the tide layer on that would just pop up the data for the station closest to your location. I'm hoping this is just user error. 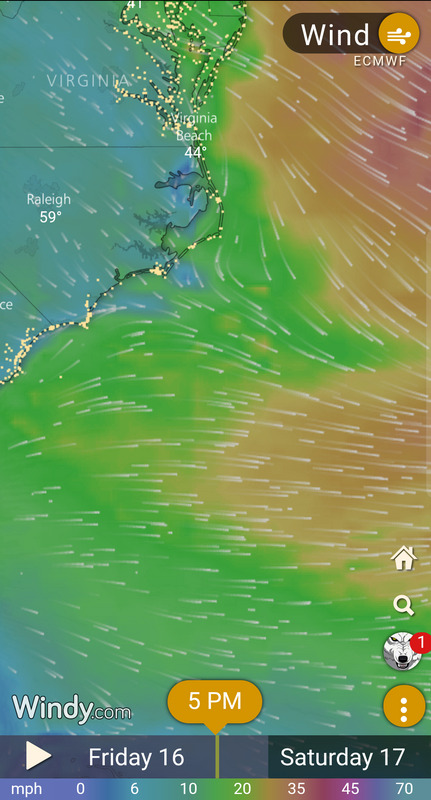 Not sure if it's at all possible, but a tidal graph like this one is very easily read and even much more informative when interactive where you can slide to a specific time or date to see the forecast; Just a thought. Well done. The next, even more useful step would be to add a tidal stream animation layer. Any chance? I sail on the west coast of Scotland, where the plan is normally ‘to go with the flow’, and having an animated, time variable layer would be a great aid to planning. Love your work. Fast and accurate for Brisbane Australia. A very good idea !!! Somebody for search harmonic tide algorytm in Spain NW coast ? Well done, that was a missing feature. I'm a solo ocean sailor, kitesurfer and snowkiter, dreaming about combining sailing and snowkiting in Norway at some point. especially in the English Channel (east of Dover), the tides can produce some very weird pattern with double high tides in a cycle due to strange interference. See also this paper. These cases make a visualization very important, instead of just raw High and Low values. -- German tide forecasts in Northern and Baltic Sea bsh.de - nice to see the difference between astronomical tide and ocean model prediction, including an error estimate. last, for all the whitewater enthusiasts, I know the "tide" on the rivers are of utmost importance! This is probably a bigger project, to keep you guys busy, but would be great to see as well. I guess also to see correlation of accumulated rain and flooding. I agree with your remarks and specially with the advantage of a graphic presentation of the tide variation during 1 or 2 days. Then you think that tidal coefficients should be nice. Sure, but I am surprised that you use them in Norway. Could you give information about these coefficients. (Same question asked to @timber2 but not received any answer). Great to see the icons for the tides. Maybe the date could show? For the Netherlands it works fine, but..... i was calculating with which hight my ship can pass the bridge. During calculating i experianced that the tides are given in “LAT” (which is not shown) while i was calculating on “NAP”. Maybe showing both is an option. Or when this is not an option because only the Netherlands is calculating by using “NAP” then at least say or show that it is in “LAT”.